The Bee Gees were, of course, the three English brothers Barry, Robin and Maurice Gibb. As well as selling over 200 million records worldwide, the Gibbs brothers also wrote songs for numerous other artists including Chain Reaction for Diana Ross and the two tracks Heartbreaker and All The Love In The World for Dionne Warwick. Much of the Bee Gees success came in the 60s and 70s, and especially during the disco era with the songs Stayin' Alive, Night Fever and Tragedy. 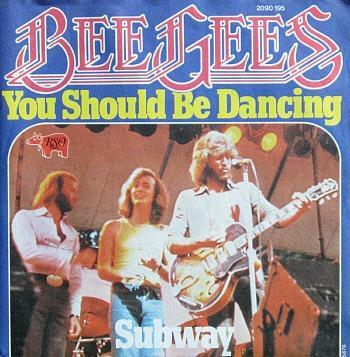 Released on 31st May 1975 as the lead single from the album Main Course, Jive Talkin' was seen as a comeback single for Bee Gees, and was their first major hit since Run To Me hit the top ten in 1972. The song topped the Billboard Hot 100 and peaked at #5 here in the lads home country. Two more singles were released from Main Course and these were Night On Braodway and Fanny (Be Tender With My Love). The summer of 1976 will be remembered not only for the infamous drought here in the UK, but also for this fantastic floor-filler. 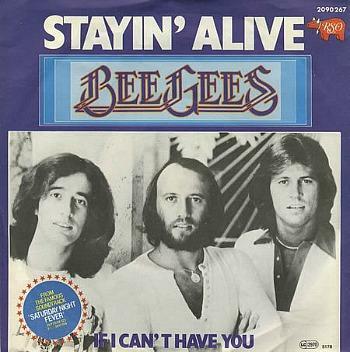 This was the first chart-topper for Bee Gees to feature that legendary falsetto from Barry Gibb in the lead vocals - he had used it before but not on a chart-topper. The track was lifted from the album Children of the World and reached #5 in the UK and #1 in the U.S.
What a fantastic disco tune this was, and, no doubt, there will be many of you who can remember going out on a Saturday night with the top buttons of your shirt undone, exposing your hairy chest and strutting your stuff to this one on the dancefloor. The tune was written and produced by the trio and featured on the soundtrack to the film Saturday Night Fever. The single spent four weeks at the top of the Billboard Hot 100 from 4th February 1978 and reached #4 here in the UK. 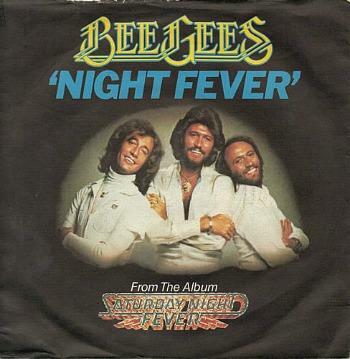 The final single to be released from Saturday Night Fever topped the charts for two months in the U.S. and also hit the No.1 spot here in the UK, too. Interestingly, the song pushed Andy Gibb's Love is Thicker Than Water song off the top spot. Andy was the younger brother of the family and died aged just 30 after a long battle with depression and drug addiction.